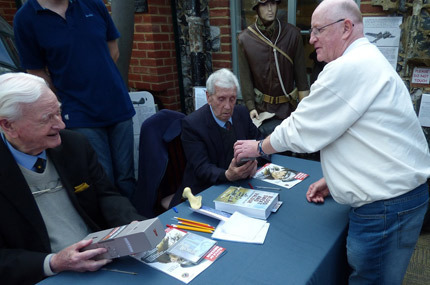 The first Sunday in October 2016 saw the Museum given over to the Army for a signing event. 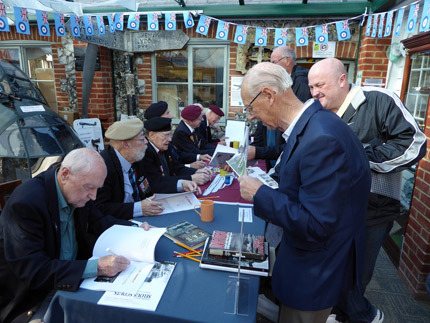 Author and supporter of the Normandy Veterans Association, Raymond P. Newlyn, came to Shoreham to sell his books along with D-Day, Normandy and Arnhem veterans featured in the titles ‘D-Day 70’ and ‘The Airborne Club’. 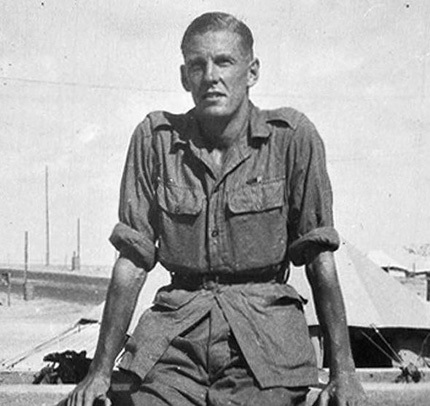 They were Paratrooper ‘Jock’ Hutton, Special Forces Alec Borrie, ‘Tankie’ Walter Fuller, Wireless Operator Bob Stevens, Medic’s David Whiteman & Alec Hall and Stanley Marsh of the Royal Navy. 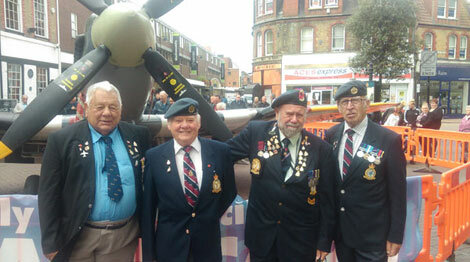 To add to the great spirit of the day other visitors included RAF air gunner John Waye and the Pearly King & Queen, who kindly brought with them two wonderful Chelsea Pensioners resplendent in their long scarlet tunics. 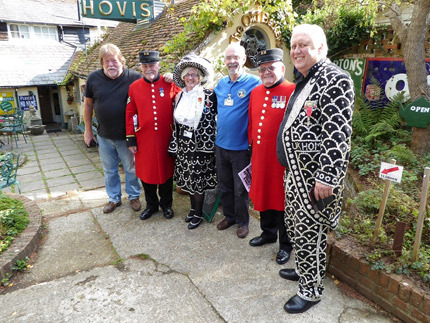 The Pearly King of Camberwell & Bermondsey Jimmy Jukes MBE, and the Pearly Queen of Rotherhithe Michelle Thorpe, devote all their time to helping homeless ex-service personnel find and furnish suitable accommodation. 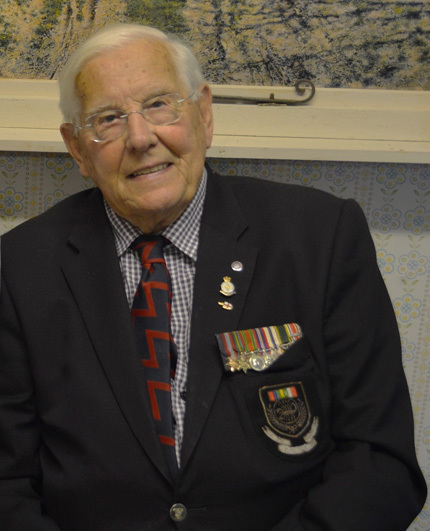 The dear members from the Royal Hospital were ‘In Pensioners’ John Gallagher (006) ex-Royal Army Ordnance Corps and Dewi Treharne (327) ex-Royal Corps of Signals. 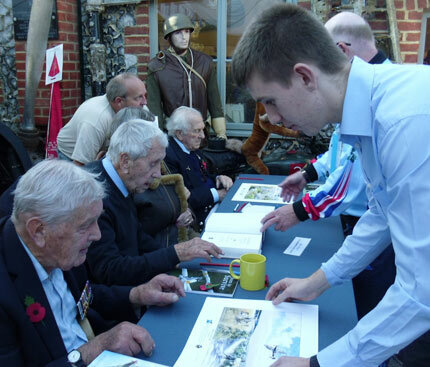 The event was well supported by visitors who eagerly snapped up copies of Raymond’s books complete with all signatures as well as getting their own items signed, so several hundred Pounds were raised for both the Normandy Veterans Association and Museum projects. 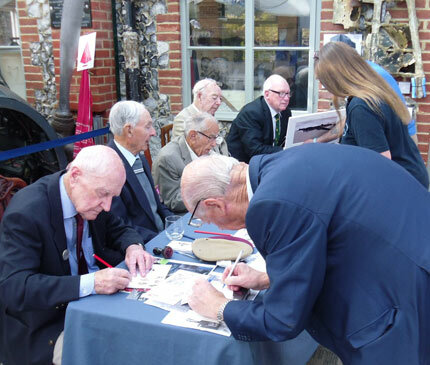 The Museum was proud and delighted to welcome two wonderful RAF veteran aces to help launch the 2016 season. 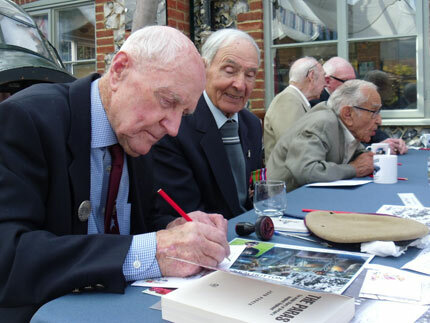 Battle of Britain ace Wing Commander Tom Neil DFC & Bar was in attendance along with Squadron Leader Allan Scott DFM, who gained ace status over Malta. 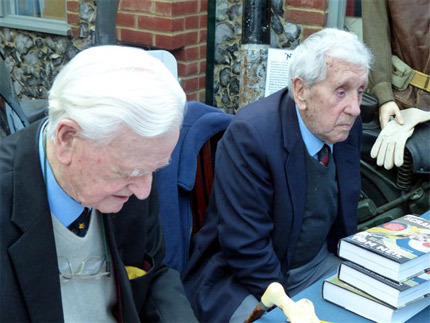 The opportunity to meet these wonderful gentlemen drew a good crowd of visitors despite the poor weather and books, prints and model aircraft were duly signed. As a token of thanks to Tom and Allan for their very fine signing efforts, Club member Ronnie ‘The Flying Scotsman’ Lamont presented each of them with a bottle of Scotland’s finest tipple, which were warmly accepted. There are still some pilot signed portraits available of Tom Neil and the late, great Captain Eric ‘Winkle’ Brown, priced at £25 each + p&p. Please contact the Museum for details. 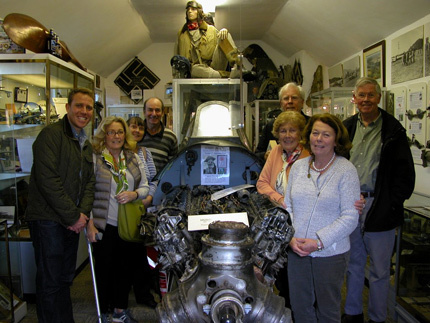 The Museum was recently delighted to receive a visit from popular RAF Spitfire ‘ace’ Flight Lieutenant Rodney Scrase DFC. He has been a very supportive ‘Friend’ to the Museum for many years, so it was an added proud moment when Rodney and his dear wife Sue were presented with the original portrait painting of a younger Rodney, by Museum Curator and artist Geoff Nutkins. Both Rodney and Sue were delighted to receive the portrait and Sue in particular couldn’t wait to get it home to hang in pride of place. 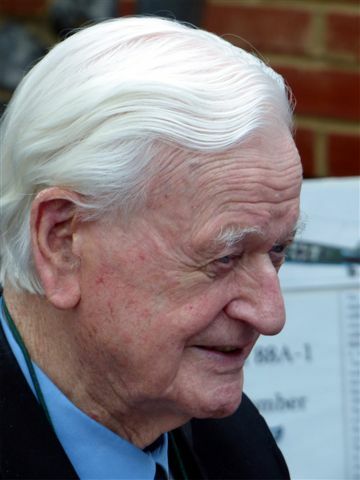 Rodney is due to attend the upcoming Ruxley Manor Garden Centre War Veterans Signing Day on Saturday 20th June 2015. 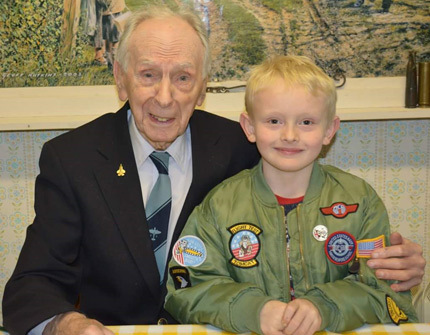 To herald the start of the 2015 season on Saturday 4th April, it was a wonderful privilege for Shoreham to welcome the distinguished and record breaking veteran test pilot, Captain Eric ‘Winkle’ Brown CBE DSC AFC Hon FRAes RN, as guest of honour. Arriving to a much appreciated guard of honour from members of the Bexley & Lewisham Sea Cadets, Captain Brown soon settled in to greeting many visitors to the Museum and to sign their personal prints and books. 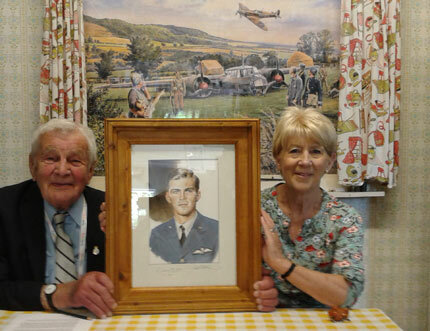 After a spot of lunch, Captain Brown was presented with the original portrait of him painted by the Museum Curator and artist Geoff Nutkins and on his delight in receiving the portrait he remarked that, “It felt good to look young again!” Captain Brown then held an audience captive to hear several recollections of his remarkable aviation career as he kindly answered many questions. For those lucky enough to listen to this outstanding man, they all appreciated what a unique and privileged moment this had been. 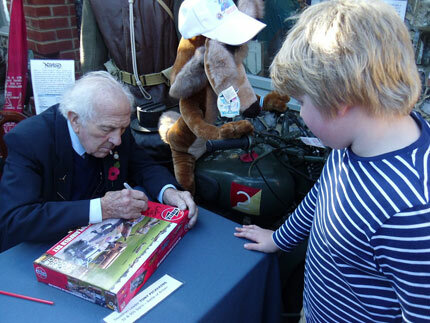 The Museum cannot thank Captain Brown enough for being so generous with his time and not tiring in his warmth of greeting to members of the public both young and old. 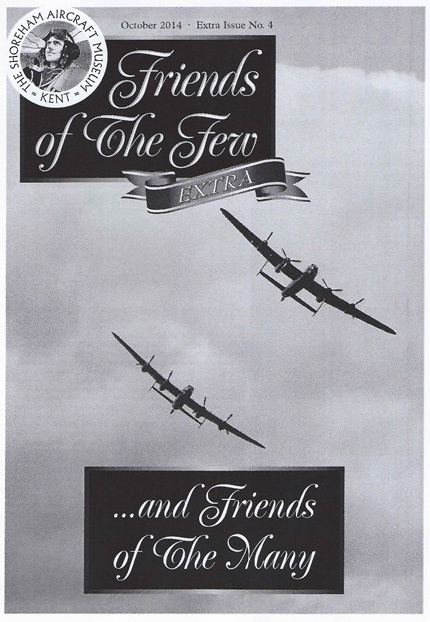 Thanks also go to members of the Erith Air Training Corps Squadron for helping out during the day alongside the band of Museum and Tearoom volunteers, which all contributed to a wonderful start to the new season at Shoreham. 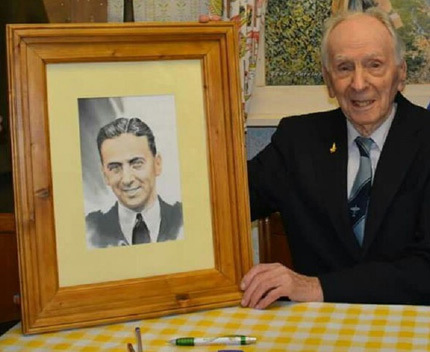 Signed copies of the Captain Eric ‘Winkle’ Brown portrait are available for purchase – please contact the Museum for more details.